We're lucky to have firefly insects in our yard during most of the summer. It's delightful to see fireflies blinking and twinkling in the evening! It brings back good memories of childhood when we'd go outside to see if we could catch a few of these magical little insects (but of course we'd let them go later!). Every summer, starting in early-mid June, we're treated to the magical sight of fireflies glowing and flashing during the warm evenings in our backyard and nearby woods and fields. This summer in particular has been especially good for seeing fireflies where we live in southeast Michigan. When I've been in a whimsical mood (and especially as a young child), I could imagine that fireflies were really little glowing "Tinker Bell"-type fairies flitting around our yard. How do fireflies light up and flash? And what do they look like when they're not flashing? What Do Fireflies Look Like? The last question above, "what do they look like when they're not flashing", is one I can answer from my own observations. Fireflies very easy to catch and to see up close. Recently I've found a couple in our house and in my work studio so I was able to look at them very closely (I found both in bathrooms, interestingly enough -- I think they were attracted to the moisture since we've had a very dry summer). Fireflies (or lightning bugs) look like rather non-descript "bugs" when they're resting on a plant during the day. They're small, at least in our area - about half an inch long. Click on the photos below to see these interesting insects in more detail. There are many species of fireflies, but the ones shown in the photos below are the same as (or similar to) the ones we see in SE Michigan. Fireflies are not "flies" in the entomological sense, but are really beetles (order Coleoptera) in the Lampyridae family. The fourth picture shows a flying firefly with its abdomen hanging low. It's easy to see how they could look like teeny Tinker Bell-type fairies, isn't it? Fireflies have a property called bioluminescense, which is the ability of organisms to produce their own light. Fireflies have a photic organ (light-producing organ) at the end of their abdomen. The photic organ takes in oxygen, which combines with the chemicals luciferin and luciferase in a chemical reaction that produces light. This is called a "cold" light, because the chemical reaction doesn't produce heat during the production of the light. These photos show the white photic organ in a firefly. The first photo was taken with a flash, and the second is the glow from the firefly. Why Do Fireflies Light Up? Fireflies flash to signal that they're looking for a mate. In general, you'll see the male fireflies lighting up as they fly. The females stay put near the ground. When a female sees the flash of a male firefly, and if she is ready to mate, she'll flash back. They'll continue flashing back and forth to each other, like in a "call and response" dialog, until the male reaches the female. Each species has a different flashing pattern, and they only respond to that pattern. HOWEVER....some species of already mated females will then change their flash pattern to a different species pattern, luring in the male, and then...EATING it! I guess that's a way of getting sustenance without killing off their own males (such as in praying mantises, in which the females eat the males after mating!). Not all firefly / lightning bug species flash as adults. 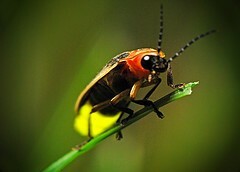 In the United States, most of the flashing fireflies live in the east half of the country, while most of the firefly species that live in the west half don't flash. Perhaps those species find mates through pheromones, or by visual cues. But all firefly larvae, and firefly eggs bioluminesce. The glowing and flashing of the adults, larvae, and eggs also serve to warn other animals that they taste bad. If you want to study fireflies yourself, you might decide to catch a few and place them in a jar. 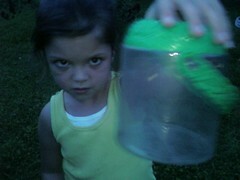 Catching fireflies is very easy. They're easy to spot, they don't fly very fast (at least not in our area), and they don't bite (just in case you were wondering!). You might find them in your yard, or in a field, marsh, or wooded area. You'll know they're around if you see the flashing! It works best to be in an area without outside lights, so the fireflies aren't confused or scared away by excess lighting. If you're in your own yard, turn off any exterior lights. 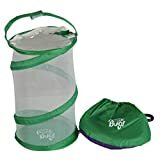 Use a butterfly or insect net to catch the fireflies, and carefully transfer to a jar with a lid that has holes punched in the top, to let in air. Or you can cover the jar with a piece of screen or mesh cloth. 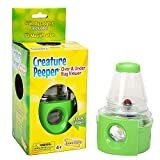 You can also buy insect observation holders through Amazon.com (to right) or perhaps in your local hobbies and crafts store, or nature stores. If you plan to keep the fireflies in the jar for more than an hour, put grass or a moist paper towel in the bottom. Don't keep them for more than a day, because they will most likely die. 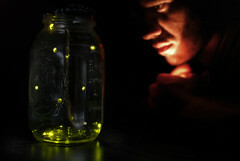 You might be able to catch enough fireflies in your jar to be able to read by their light! Read How to Catch Fireflies for more tips. 255/365 - capturing light in jar. What Else Do We See in Our Backyard? We have three, possibly four, different kinds of squirrels that visit our backyard. Here are nine common birds we see in our backyard and around the neighborhood. Nine more birds that are common in our backyard and around our neighborhood. Here are eight birds that we commonly see at our backyard feeders during the winter. Monarch butterflies are the only butterfly in North America that migrate long distances. Why Do Lightning Bugs Flash? Do You Have Fireflies Where You Live? Fireflies are unique species! This just reminded me of Princess and the frog movie firefly, ahh he was so adorable and cute! Sadly I never see them in here. So I can say "Love is in the air" when I see fireflies flashing all around me on a summer night! Loved reading this. We have many fireflies where I live during the early months of summer. Catching jars full of them and keeping them for a night in their bedrooms was a fun thing when my children were young. Then we let them go the next morning. I grew up in Illinois and used to get so excited seeing them light up the sky...always tried to catch them, but let them go. Though we have the beautiful Rockies of Glacier National Park in the summers we're in NW Montana, haven't seen one...do miss them! I love fireflies. They make me think of my childhood. I caught many a lightening bug in a glass jar. Fireflies do seem magical and are a sight I'd love to see. I had no idea that the females will eat the males though! I saw many of them growing up in Illinois...but I don't recall seeing them in Florida. Interesting facts on these cute little bugs. Yes, we have fireflies or lightening bugs in my area. I still love to watch them at night. Here are some safe, natural methods for getting rid of grubs that kill your grass. These include the larval form of Japanese beetles, European chafer beetles, and other scarabs. Japanese beetles can cause extensive damage to the leaves and flowers of many different kinds of plants. Here are some ways for getting rid of these destructive insect pests.